This is an informative session for those involved with off-grid solar solar, regardless of the application. Displays of system status & log data directly from the EMC-1 to a webpage. 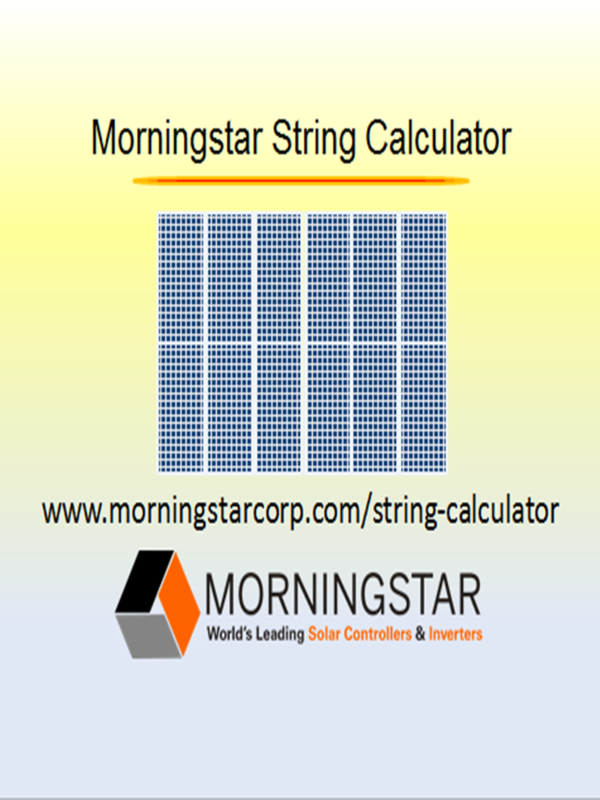 Learn about the New ProStar MPPT Solar Charge Controller from Morningstar. You will hear about lighting control, data logging and other capabilities and how you can adjust controller settings through the meter interface of this mid-range MPPT controller. View this recorded webinar to learn how the New TriStar 600V Charge Controller with DC Transfer Switch can be deployed with other components to retrofit existing grid-tied systems with battery backup power. The costs and benefits of this Direct DC Transfer Charging Solution are compared to other solutions such as AC Coupling. You will see why this internationally recognized product and application is scalable, easy to install, and represents the lowest cost of entry for battery backup in existing grid-tied systems. This joint webinar between Morningstar and Sunwize Power and Battery provides information about several different Morningstar PWM and MPPT charge controllers that are used in a variety of different off-grid solar applications including Oil & Gas, Telecom, and Traffic Monitoring. The presenters also make key points about efficiency specifications, TRAKSTAR MPPT Technology, and the importance of good system design. Russell Borum, Sr. Account Manager with Morningstar shares his experience working on solar lighting applications throughout the world. During the webinar you will learn about: Different applications of solar lighting, choosing the right charge controller and programming an MPPT controller for lighting. This recorded webinar provides information about Morningstar’s TriStar MPPT 600V Charge Controller and Ground Fault Protection Device including: Efficiency ratings and product specifications, Reliability and quality factors that differentiate Morningtar’s products from others, MODBUS communications, Best practices concerning ground fault protection, and Use Cases. The Q&A session at the end of the webinar featured lively discussions about alternatives to AC coupling, ground fault detection, and string sizing. Due to popular demand and much interest from our customers, we opened up our training archive … This in-depth webinar training module highlights the technological advantages and benefits of Morningstar’s advanced TriStar MPPT charge controllers. Check it out for yourself. For Off-Grid Installations … When Reliability & Performance Matter … From the more load sensitive Telecom & Instrumentation Systems, to the most environmentally harsh installations of Industrial Oil, Gas & Marine Systems—Morningstar’s SunSaver Solar Charge Controllers are the Proven Choice.